The SsAM Choir is the main parish choir consisting of 20-25 singers with a core of eight professional staff singers (The SsAM Collegium). 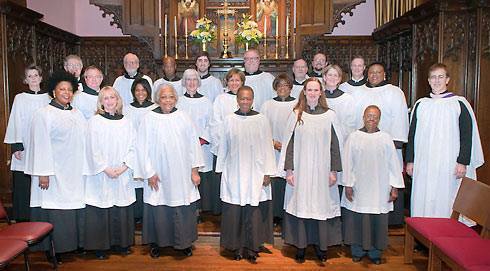 The SsAM Choir sings regularly at the 10:30 a.m. Sunday liturgy as well as for special feast days and occasional concerts. Rehearsals are on Thursday evenings 7:30 – 9:30 p.m. Membership in the choir is open to members of the parish as well as singers from the community. Because of the difficulty level of the repertoire as well as the choir’s rigorous performing schedule, strong music reading skills are necessary. To inquire about singing with the SsAM Choir, contact the church office at 302-656-6628 or via the e-mail link below. 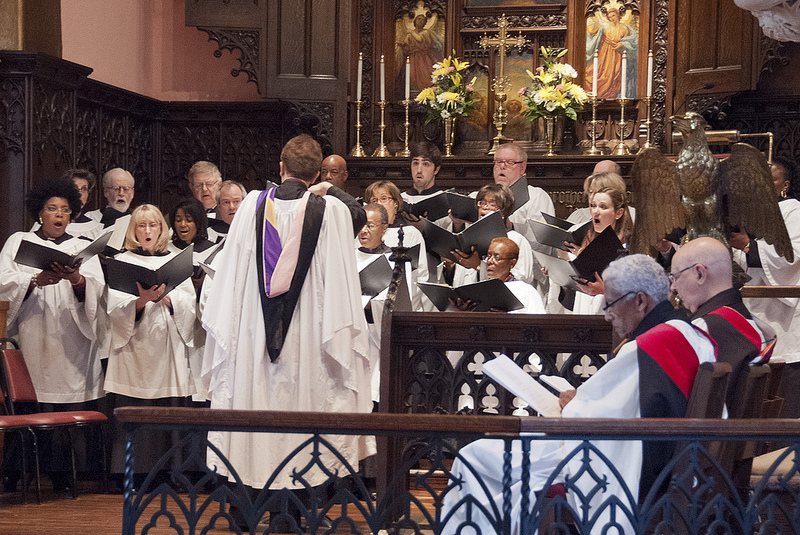 Consisting of SsAM’s eight professional staff singers, the SsAM Collegium supports the singing of the parish choir and occasionally performs separately in concerts and special liturgies. In addition to singing frequently in the context of liturgy, the SsAM Collegium performs throughout the community. Click here for photos and bios of each of the singers. 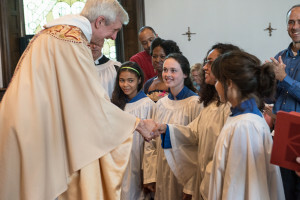 Bishop Wright welcomes new choristers into the St. Cecilia Girl’s Choir at the Bishop Visit, June 1, 2014. The Treble Choir at SsAM is a multifaceted program for children in 3rd grade through young adults. Singers receive private and group musical training through the SsAM Chorister Training Program (CTP). Singers participate in liturgies at SsAM based on their level of experience and musical skill. The advanced singers perform on a regular basis in combination with the SsAM Choir. Membership in the choir is open to singers from the parish as well as from the community. Interested singers or their parents should contact David Christopher, Director of Music through the church office. Ensemble-In-Residence at SsAM, Delaware ChoralArts serves the greater Wilmington area by enriching the community through excellent and inspiring performances of great choral literature; supporting its talented and dedicated membership with professional skill and leadership; and nurturing the art of choral music through scholarships, commissions and showcases. Known for its expressive singing, varied and diverse programming, and its ability to produce a thrilling “wall of sound,” Delaware ChoralArts (DCA) has brought a rich palate of choral music to the region since its beginnings in 1984. In addition to having sung with many orchestras from the region, DCA first performed with the Delaware Symphony Orchestra in the summer of 2009 as part of the City of Wilmington’s 4th of July Celebration in the Tubman-Garrett Park on Wilmington’s Riverfront, followed by a collaborative performance of the Brahms Requiem in the spring of 2012. DCA strives to nurture and develop young people’s appreciation of the choral art through its competition for young composers and now through its “side-by-side” collaboration with high school students as well as its frequent collaboration with the Wilmington Children’s Chorus. DCA is run by a dedicated Board of Directors made up of members of the chorale along with support from members of the community who serve in an advisory capacity. Funding for DCA comes from a number of sources including generous grants from the Delaware Division of the Arts and The Dupont Company, a growing number of enthusiastic Patrons, fund raising projects and ticket and ad sales. To learn more about music at SsAM, please contact us.